John Joubert is quite a prolific composer. 90 this year, his opus numbers approach 200, and amongst these are eight operas. This recording on SOMM is something of a labour of love, a 90th birthday present for Joubert. Recorded live at a one-of concert, it brings Joubert's Jane Eyre to the world for the first time. Kenneth Woods conducts the English Symphony Orchestra with April Fredrick as Jane, David Stout as Edward Rochester, Clare McCaldin as Mrs Fairfax and Mark Milhofer as St John Rivers. Written to a libretto by Kenneth Birkin (a Richard Strauss scholar), the opera was written without commission over the period 1987 to 1997. When prospect of a performance seemed possible, Joubert returned to the work and revised it, removing instrumental interludes (these are now part of his Symphony No. 3), shortening the opera from three to two acts. Altogether some 40 minutes of music was removed. The resulting opera now lasts 110 minutes. Act One opens with Jane about to leave Lowood School. Scenes at Thornfield follow ending with a love duet for Jane and Rochester. Act Two opens with the interrupted wedding, followed by a scene at the Rivers and the final scene with Jane returning to Thornfield. In an interview appended to the second CD, Joubert talks about improving the work by removing secondary scenes, but I wonder? The opera has admirable compactness. Yet, lasting under fifteen minutes the scene in the Rivers household gives Mark Milhofer precious little time to establish the character of St John Rivers. Discussing the opera with a friend, he commented on items missing as compared to the book. But this is opera and inevitably different. What the piece really lacks is having been tried in the crucible of theatrical performance, in a full staging with Joubert working with director and conductor on what really works in the theatre. I also wonder about the libretto, it is admirably close to the book in language, so much so that at times it feels a bit stilted, such as Rochester's big solo monologue in the final scene. And there is quite a lot of narrative in the libretto, Jane referring to her childhood at Lowood, and a certain amount of catchup in the scenes, Jane and Rochester say what they are thinking quite a lot. 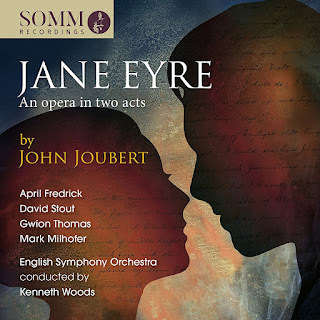 Another oddity, is that the opening of Act Two is the Vicar of Thornfield (Alan Fairs) reading the marriage service over the orchestra, it seems such a luxury in such a compact piece but Joubert's orchestral underscoring is very powerful. And then in the following scene, we have St, John Rivers reading from the bible (a sung scene this time), though here it is a neat device to establish his character quickly. It receives a terrific performance. This is a big romantic piece; it needs and gets full commitment from all the performers. I suspect that, in an ideal world, Jane would be sung by a more spinto voice than that of April Fredrick, at key moments she seems slightly pushed, but never overwhelmed and she never forces. She gives an admirably committed and passionate performance, bringing to life Joubert's lyrical, singer-friendly lines. In the terrific opening scene with Gwion Thomas's Mr Brocklehurst, she really establishes Jane's backbone and spunkiness, which helps counterbalance some of the big romantic numbers. Her put down of St. John Rivers is great, you only wished for a bit more! April Fredrick is matched by baritone David Stout, making the most of the opportunity to play a romantic hero and get the girl (something frequently reserved for tenors). Stout makes the fine transition from the caddish character of the opening to the maudlin final scene, though not too much maudlin. Both duets for Jane and Rochester soar. Which brings us to influences, you can hear Britten in the piece, and other composers like Arnold and Alwyn. But Joubert is somewhat out of time in the big romantic sweep he gives the piece. Though his style is no pastiche, and you are aware of the richness and complexity of his orchestration and harmonic language. In many ways this is a very symphonic opera. Mark Milhofer makes a good shot at St. John Rivers, who is stern and unsympathetic, but Milhofer makes good vocal amends. In fact, Milhofer doubles as Rochester's brother-in-law, Richard Mason. The opera has a large cast, 17 named characters her played by 12 singers. The others are very much supporting roles, but everyone gives a strong sense of character, though only Gwion Thomas as Mr Brocklehurst really gets the chance to make his role count. For the rest, this is very much an opera about Jane, Rochester and St. John Rivers. Kenneth Woods and the English Symphony Orchestra do sterling work. The recording has been patched, but most of what we hear is live and Joubert writes complex symphonic music. Frankly I think those removed interludes a great loss. This is a big romantic piece with its heard in the right place and nowadays we are more comfortable with contemporary romantic opera. I would be fascinated to see it on stage, as one or two things about the dramaturgy troubled me, though it is full of terrific music.